I was actually quite surprised when I compared today’s view with last week’s – not as much change as I thought after all the wind and rain we had. We can see up into the woods now though (behind the acer). Binocular man on the right is being swamped by the Cotoneaster, which will have a drastic haircut once the berries have gone! Enjoy the last few days of October! Was it a golden month for you? This entry was posted in Garden, Nature, Plants, Tuesday View and tagged Autumn, Garden, Nature, Plants, Seasons, The Tuesday View, Tuesday View. Bookmark the permalink. You have been lucky with the weather this autumn Amelia. Hope it continues for you next month too! Still looking rich. I like your prunus and Heuchera combo. October has been wonderful here, but we are getting warnings about big weather changes this weekend. Good to hear you’ve had a nice October too Susie. November will bring changes for us all I suppose. 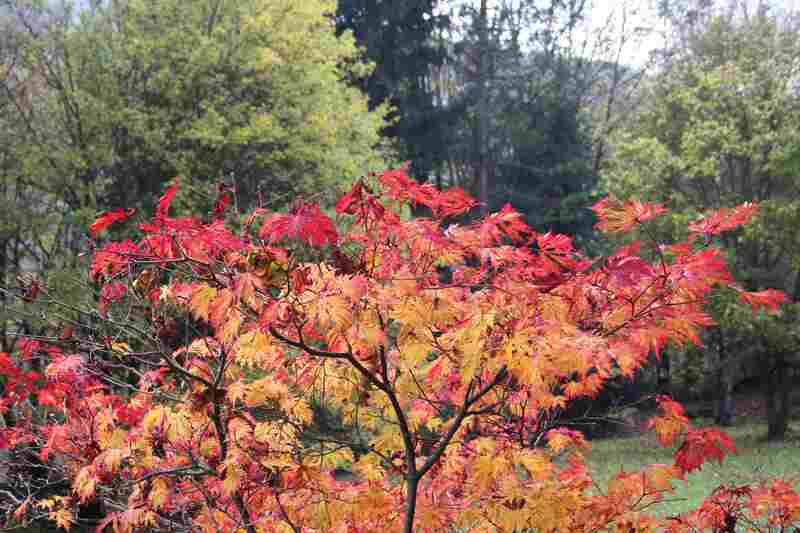 The Acer is beautiful, enjoy every minute of its glorious colour! 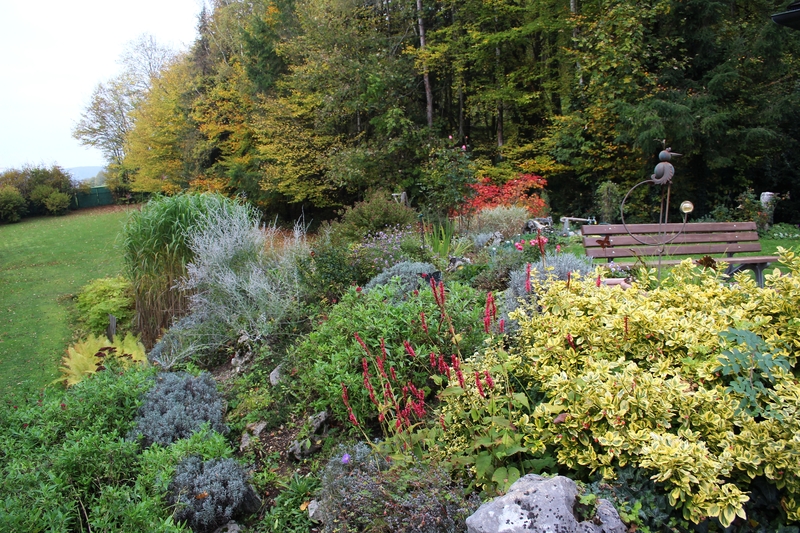 Your view looks wonderful Cathy, lots of autumnal colour too. We have been blessed with a warm and sunny October a dip and rain due tomorrow then back up to 19c on Friday. I hope there will not be a payback in the winter though! 19 degrees? Wow, that is great! Hope it stays mild a while longer for you! beautiful colors, especially the Japanese Maple!! The maple is always a real showstopper! 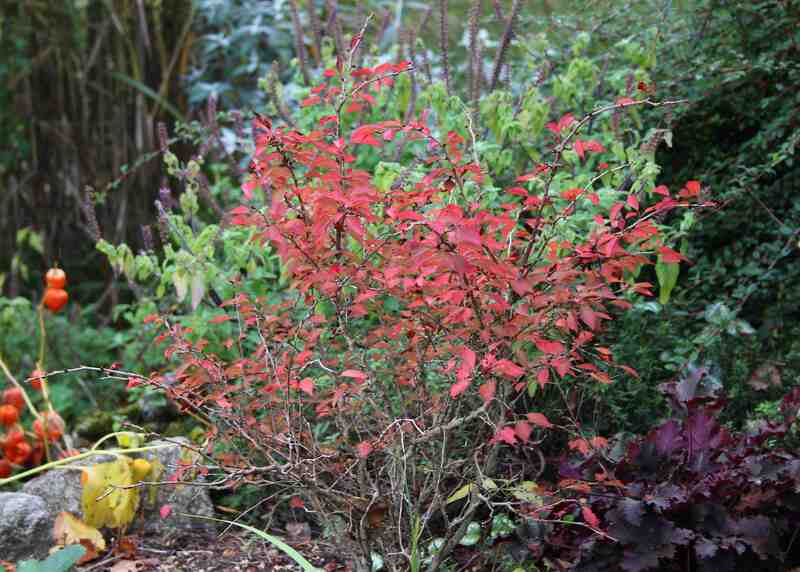 Oh what a beautiful acer Cathy – it’s positively singing. October has been a mixed month here – much wetter and windier than September but noticeably mild. It seems Europe has mostly had mild weather this month. I wonder what November will bring…. It has been a golden month! Many beautiful days when the sun set the autumn foliage aglow! Your Acer is gorgeous! I know it here as a Japanese Maple. Now you’ve reminded me that it is Tuesday, and I did not post my own Tuesday’s View today! It was unseasonably warm, so I spent most of the day planting bulbs. Then I got caught up in feeding my family dinner and transporting my kids down to march in our town’s Halloween parade, and now it is dark! Next week. . .
Good to hear you’ve had a good October with plenty of sunshine, and also good that you have done your bulb planting! I haven’t quite finished planting mine yet. Look forward go seeing your Tuesday post next week Kimberley! Everything seems to glow in your golden October light! Any comments on the Physalis? I always hear scary stories about it yet those seed pods really stand out and are perfect for this time of year! 🙂 Frank, please don’t even consider planting Physalis!!! Yes, it IS beautiful, and really does look like little lanterns lighting up the rockery, but it is sooo invasive…. Lovely colours! Most of the reds and oranges round here have given way to browns although I did see the most amazingly fire-orange bush in someone’s garden yesterday – it looked like hundreds of red hot pokers spiking all over the place. I wish I knew what it was. I know what you mean… the last two Christmases were really warm here, so I am hoping for snow this year. But will I regret saying that?! Your Acer is so beautiful! Yes, this last month is a golden month, we are having quite warm weather at the moment with the wind coming from the south, so our colours are taking their time, not much red yet. It’s nice if you can enjoy the colour at a slower pace, even if it doesn’t turn out to be so dramatic in the end. Last year our leaves fell much more quickly, and raking them up was a matter of a few days’ work. Quite a bit of “golden” round here at present. Glad you’re getting some colour too. The beech are lovely this year, but the sycamore were a bit fleeting. Your acer is showing such beautiful warm autumn colours. I love these pictures. What a glorious Acer. I love it and your little cherry. They are hanging on to their leaves so long aren’t they? We are having such a wonderful October this year, it is so mild. I think the acer and cherry leaves are still hanging on because it’s been mild here too – no frosts yet, although chilly nights, and the long-term forecast is much of the same! Yes more golden than usual. 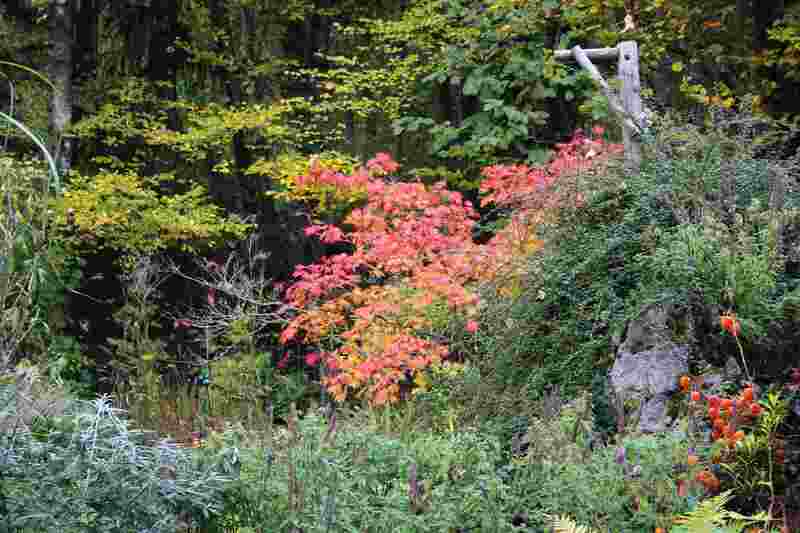 I love the soft autumn colors that are spreading into your garden Cathy especially the acer. The yellows have been particularly pretty this year Donna, and with lovely sunshine today even the kitchen on the north side of the house was filled with wonderful yellow light! This whole month flew by, and this week in particular, Cathy. I’m enjoying some time tonight getting caught up….all the way back to Tuesday! LOL! You are describing weather that sounds like winter is coming, although still mild. Your garden still has plenty of life left. I’m waiting to see when I’ll really notice big changes! Not yet! 🙂 Hope you have a really lovely weekend, Cathy. Hi Debra. it is still very mild and sunny here. No sign of winter yet, but preparations are being made just in case it turns frosty. I doubt if there will be very much change for another week or two. 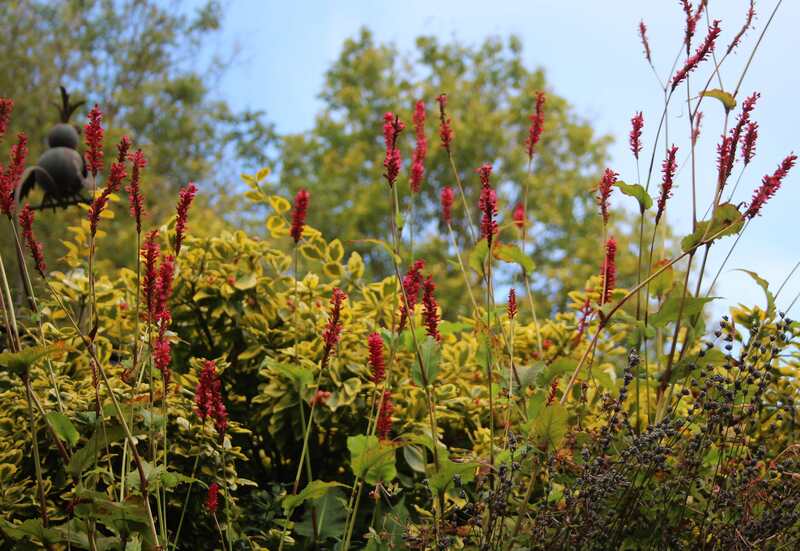 Your acer is beautiful, and I love the way the persicaria picks out the colour of those leaves too. Fascinating to beging to get a peak into the woods too. Such pretty colours, just lovely in general. Thank you! We are having a mild autumn this year!